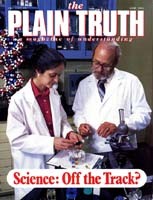 Is Science Off the Track? As science unravels the genetic code, is biotech about to spawn a malevolent biological age? THE ANXIOUS couple sat down timidly in front of a steel desk. A medical researcher, already seated and hardly aware of their presence, peered intently at a sheaf of papers spread before her. "Hmm, yes, Mr. Hancock, we did find some evidence of genetic damage that must have been transmitted by your mother — you did say that she admitted to extensive recreational drug use during the 1960s?" The husband swallowed hard and nodded weakly. In a choked voice he stammered: "Ah, does this mean that we won't be able to have normal children?" Instantly the researcher looked up, smoothed her crumpled lab garb and in a surprised and almost indignant voice said: "Of course you'll be able to have genetically normal children, Mr. Hancock. It's a very simple procedure to repair the inherited gene damage." The above dialogue is fiction. But if today's genetic research and development continues at the present frenzied pace, it may not be fiction for long. "Through a genetic window, we can know with uncanny, sometimes disturbing accuracy the most intimate facts of the legacy brought by our spouse's background and the quality of life we may expect for our children," asserts Dr. Marc Lappe, author of Genetic Politics — The Limits of Biological Control. Nicholas Wade, a senior writer for Science magazine, claims that gene-splicing has put "the whole gene pool of the planet... at our disposal. The key to the living kingdom has been put into our hands" (The Ultimate Experiment — Man-made Evolution, page 2). Barely a decade old, the modern genetic industry worldwide has assembled both scholarly research teams and the hard cash needed for proper funding. In the United States alone, more than 100 fledgling gene-splicing companies and entrepreneurs have boldly waded into the microscopic world of biotechnology, or "biotech," as it has come to be known. The top five companies employ more than 1,700 researchers, and eager investors have plowed hundreds of millions into public holdings, hoping to cash in on the "tiny" revolution. Biotech research is not limited to the United States either. Private industrial and governmental laboratories in Japan, the United Kingdom, Switzerland, West Germany and France have joined the race to dominate the new industry. Thus far, the investment has paid off handsomely. To the general public, the now — accepted term biotech may be fuzzily associated with test-tube babies. But biotech is far more than the now well-known in vitro fertilization, where a human or animal egg is removed from an ovary, fertilized with sperm in a laboratory culture dish, and subsequently reinserted in the mother's uterus. Indeed, test-tube babies represent but the small tip of an enormous scientific iceberg. Amazing results have been culled from laboratories worldwide in an equally amazingly short time. Fueled by an intense competitive drive that rivals the scope of the World War II nuclear Manhattan Project, researchers now assemble man — designed vaccines and chemical additives never before deemed possible. A study released by the U.S. Office of Technology Assessment claims that biotech could produce microorganisms that literally eat toxic wastes, promote faster and higher quality growth in farm stock and organically engineer substitutes for oil products. Biotech is foreseen as also applicable in fighting diseases such as herpes and cancer. Equally impressive is the effort aimed at correcting genetic defects. If science is successful, doctors will be able to examine and correct so-called lethal genes — genes that result in physical and mental defects. Some researchers insist that within this century, genetic manipulation will remove the tragedy of birth defects. The infant biotech industry is made possible by the 1973 understanding of how to break apart and mold together the molecular blueprint of a gene (deoxyribonucleic acid or DNA) and the messenger molecule (ribonucleic acid or RNA) that reads and transfers the DNA blueprint. Ever since the first humans understood that living beings mate "after their kind" (Gen. 1:21), animal breeders and farmers were challenged by the possibilities of selective breeding. And now scientists have been tantalized into mapping out chromosomes, the microscopic bearer of the DNA genetic code. But even as science unravels this same genetic code, the fear arises that science may also be unwittingly opening a molecular Pandora's box. As research in the gene-splicing industry began heating up in the early 1970s, many scientists worried that a well-meaning research team might accidentally unleash a new, powerful and possibly unstoppable microorganism. Would certain nations or terrorist organizations focus on developing and using such man-made malignant material? Clifford Grobstein, an eminent biologist, voiced another possible danger: "By manipulating genetic substance could we inadvertently dislocate delicate balance and unleash catastrophe?" When word spread that one prominent research team was considering developing new cancer — like qualities in Escherichia Coli cells, scientists wisely called a halt. E. Coli is a naturally occurring simple microorganism often used in laboratory experiments because of its favorable characteristics, most notably its ability to reproduce rapidly. It exists in great quantities in the human body. What would happen if altered and now — virulent E. Coli cells escaped to animal or human hosts? One researcher called it "a pre-Hiroshima[-like] condition. It would be a real disaster if one of the agents now being handled in research should in fact be a real cancer agent." Within a short time after the ending of the proposed research on E. Coli, 140 scientific leaders from Europe, the Soviet Union, Japan, the United States and Canada gathered at the Asilomar conference center in Pacific Grove, California, to map out safety guidelines for gene-splicing. That was nearly a decade ago. The individuals meeting there decided that continued research into gene-splicing was reasonably safe if done under carefully controlled conditions. And thus sprang the beginnings of the fledgling biotech industry. Why Do We Need Biotech? After the Asilomar conference, heated debate raged over the philosophical, ethical and physical issues surrounding the molecular genetic revolution. During the 1975 conference, prominent scientists worried aloud about the possible virulent consequences. One laboratory official declared: "As far as I am concerned, there is no absolute [biological] containment and all containment is inefficient." Another scientist, expressing the thoughts of many, added: "There is no way to decide right now what a safe organism is or what a safe cloning vehicle is." Many scientists still demand today that dangerous research be halted until a better understanding is achieved and universal safety measures can be set in motion. Mr. Wade answers for the scientific majority: "Such abnegation of intellectual curiosity is not in man's nature, and in any case, the question [of whether to proceed] is moot: the door to the [genetic] treasure — house is already ajar, and the only question remaining is what use will be made of the riches within" (The Ultimate Experiment, page 3). Tampering with genetic blueprints borders on the ominous. How? In the absence of perfected gene-altering technology, humans seeking healthy offspring can legally practice eugenics through abortion. In plain words, parents fearing birth defects or deficiencies in unborn children could choose abortion — induced fetus death — if genetic counseling indicated problems. "Today, over sixty different genetic diseases can be ascertained through prenatal diagnosis, in time to provide critical information about the likely quality of life of a prospective human being, for parents and less likely, for society, to make decisions as whether to continue or to terminate a pregnancy," asserts Dr. Marc Lappe. Listen to these stunning words by the same author! "As a result of genetic knowledge, we live in a universe where many more judgments will have to be made — judgments as to where genetics rightfully affects our choices of spouse or profession, or where we should compensate (or penalize) one ethnic group for an inherited disability and not another" (Genetic Politics — The Limits of Biological Control, page 28). Far-reaching words, these! If these words were put into practice by a government, one race or group of people found to be carriers of sickle-cell anemia, hereditary predisposition for alcoholism or other characteristics, could — or perhaps, under this type of dangerous thought, should — be restrained from passing on such "defective" genes. Despite such ominous implications, genetic advances offer scientists great and desirable control over individual and collective life. But consider what has happened in the past! Does humanity possess the innate ability to act properly on such genetic knowledge? What does the record say? Eugenics, a term not heard very often today, was a popular concept in the first half of this century. Early geneticists, following in the footsteps of Darwinism, began lobbying for application of "positive and negative eugenics." They meant to encourage genetically superior humans to mate and to discourage genetically inferior humans from bringing forth offspring. This concept spread like wildfire with the advent of Social Darwinism as espoused by Herbert Spencer. Simply put, Social Darwinism believed that genetically inferior humans should be allowed to die out, rather than continue transmitting their defective genes. The solution? Sterilize such genetically "inferior" beings as mentally retarded individuals and the like. Could this really happen? It did! Multiple thousands of individuals were actually sterilized in the name of eugenics in the United States early in this century. Ever hear the terms "blue blood" and "bad blood"? These pseudoscientific terms were rampant in the 1920s, and many U.S. congressmen swallowed the fable that some European immigrants brought genetic impurities with them. This led to the U.S. Immigration Act of 1924, which strongly influenced immigration policy until as late as 1965. During this same, sad time, many were sterilized against their wills! The U.S. Supreme Court, in a landmark case, even ruled that the state of Virginia had the legal right to order sterilization of one rural woman, Carrie Buck, who resisted! A major financial magazine, still published today, recommended in 1947 that mental defectives be sterilized. In 1924, Albert Edward Wiggam declared in The New Decalogue of Science: "Nothing is more certain in science than that godly parents beget godly children and ungodly stock spawns a godless brood." Such misguided thought was not limited to the United States. In 1982, records surfaced of the malevolent biological experiments in wartime by Japanese scientists in Manchuria. And few need to be reminded of what might be the ultimate expression of negative eugenics: Nazi Germany's "Master Race" experiments. We can thus see that this so-called enlightened age has also been a dark age! As-yet-unsolved questions remain for the fledgling biotech industry: What would happen if it became technologically possible for science to radically change the genetic composition of humanity? Or for gene-splicers to produce an uncontrollably lethal substance that could significantly alter delicate ecological balances? Few consider the real underlying reason why such research is even necessary! The problems humanity today faces are not primarily physical but spiritual in nature! Scientists understand that parents transmit defective genes from generation to generation — yet it is beyond physical — or scientific means to fully comprehend why. In explaining genetic damage, it is seldom considered how and why human conduct dramatically impacts future generations. Sexually transmitted diseases, drug experimentation, poor nutrition and needless exposure to commercially produced radiation negatively affect gene reproduction. But what is done to correct it? Man treats the physical effects, not the spiritual causes — lust, greed, selfishness. Humanity, it seems, always ends up treating the effects — not the cause! To treat the causes would change life-styles — even this civilization itself! And that humanity is unwilling to do. An understanding of these spiritual laws God set in motion could lead humanity away from genetic damage — for example, babies marred by sexually unprincipled parents or drug abuse. God allows humans to sin — to break spiritual laws. Therefore God also has to allow the consequences of law-breaking. And they accumulate! Those consequences are more far-reaching than most want to believe. Indeed, today's defective genes may have been the result of ancestral misconduct — the breaking of spiritual laws — decades or perhaps even a full century earlier. The penalties may pass through three or four generations (Ex. 20:5). Lust, for example, leads to drug abuse and children being born addicted to drugs. Lust leads to sexually transmitted diseases and the consequent need for Cesarean births to prevent infections. Greed leads to perverting foodstuffs and a consequent decline in nutrition leads to disease. God has decreed that man, cut off from a true understanding of the purpose of life, reap what he sows in the flesh. The first two humans set the tragic pattern for these past near 6,000 years. They foolishly rejected God and his revealed spiritual laws. You can read it for yourself in the first three chapters of Genesis. The result ? God adopted a hands-off policy. He allowed humans to create their own religions, their own governments and institutions, their own laws. God now intervenes only as it suits the purpose that he now is working out. But God never intended it to be that way. Even as he offered the knowledge of his spiritual laws to the first humans, he offers it to humanity today. You are reading that offer in the pages of this magazine! God may allow punishment "to the third and fourth generation," but by his great mercy and promise of divine healing he says he shows "love to thousands who love me and keep my commandments"! (Ex. 20:6, New International Version). God takes no joy in the physical manifestation of sin in the form of cancer, birth defects and physical weakness. "As I live, says the Lord God, I have no pleasure in the death of the wicked, but that the wicked turn from his way and live" (Ezek. 33:11, Revised Standard Version). Mankind could, by turning to the way of God instead of its present deceived path, find a fulfilling and satisfying life. Instead of tampering with dangerous molecular elements to correct the effects of generations of genetic flaw s, scientists could point up the causes of today's problems and demand we change our life-styles to prevent the problems from occurring in the first place. Thankfully, the time is soon coming — whether scientists or theologians want it or not — when the solutions will be published for all to understand and concentrating primarily on the treatment of effects will cease! If you want to learn more of the soon-coming age when dangerous genetic research won't be necessary, read our free authoritative booklet The Wonderful World Tomorrow - What It Will Be Like. Biotech is not the ultimate answer to man's biological problems. A spiritual solution — making clear the spiritual causes and effects — is.